SÃO PAULO, BRAZIL – Dozens of Brazilian cities close main roadways on Sunday so that the population may use the area to ride bikes, walk and assemble. São Paulo Mayor, Fernando Haddad, has intended to replicate that scenario when he decided to close to traffic on Sundays the city’s most famous street: Avenida Paulista, not without controversy however. São Paulo’s most famous thruway, Avenida Paulista, will now close to traffic on Sundays, photo by Caio do Vale/Wikipedia. Until now, Avenida Paulista is only officially closed a few days throughout the year, including New Year’s Eve and during Gay Pride Parade day. According to new plans, the avenue will start to be close to traffic every Sunday between 9AM and 5PM starting today, Sunday, October 18th. The plan, however, seems to be backfiring, with many neighborhood associations and even the state’s public prosecutor’s office criticizing the decision. “The Paulista Viva (Live Paulista) Association expresses its strong displeasure over the city council’s decision and reaffirms its confidence in the prosecutor’s office, which is responsible for ensuring the rights of citizens being hurt (with the closing) if the city’s administration does not reverse its hasty decision,” read a statement by the largest neighborhood association of the region. The prosecutor’s office was also critical of the mayor’s decision calling it ‘radical’. 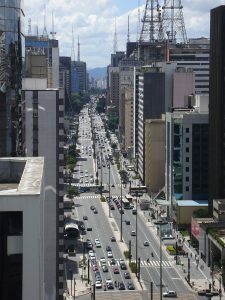 “The systematic and constant use of a road as important as Avenida Paulista as an area of leisure brings about in-numerous implications which in our opinion should be better analyzed so that it may minimize its impacts in the local commerce and in the daily routine of those who live and pass through the region,” read the statement by the public agency. According to critics the closing of the avenue to traffic will harm those who have to work on Sunday in the region and disrupt the services of approximately fifteen hospitals located on the avenue or on its side streets. A survey with area hospitals, however, made by newsmagazine Carta Capital, found that the thirteen hospitals that answered the survey stated that their services would not be hindered by the measure. In all 24 bus routes will be changed on Sunday due to the closing of Avenida Paulista. Residents of the avenue as well as those going to one of the hospitals will be authorized to enter with a vehicle, as long as the speed of the vehicle is less than 10 km per hour.